Dell finally released its innovative notebook Inspiron duo. So if you are hesitating between notebook and tablet PC, let’s go on checking the multi functional notebook. Dell Inspiron duo measures 285 x 194.5 x 26.2 – 28.7 mm. As we can see from the images, the innovative notebook features a horizontally rotated 10.1-inch multi-touch screen with 1366 x 768-pixel resolution along with an outer frame. Once you flip the screen outward and close it, your Inspiron duo laptop will convert to a 10.1-inch tablet PC. No doubt, its Intel Atom Dual Core N550 (1.5GHz/1MB cache) processor and 2GB DDR3 RAM make the unique tablet faster than common tablet PC, and the weight of 1.54Kg makes it become a selection between laptop and tablet. Moreover, Dell Inspiron duo comes with Intel NM10 Express chipset, integrated Intel NM10 graphics, 320GB SATA HHD (7200RPM). Other interfaces and parts also include WiFi, Bluetooth, SIM card slot, USB 2.0 port, 2 speakers, built-in microphone, headphone jack, integrated 3.1-megapixel webcam. At last, Inspiron duo ships with Windows 7 Home Premium. After the break, check out the demo video. 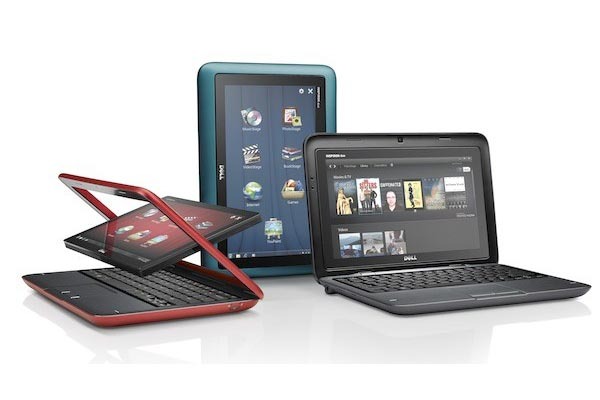 Dell Inspiron Duo Convertible tablet PC comes in three colors, including black, red, and blue. For the time being, there is just a black one available at Dell official site. The price is 549.99 USD. If you’re interested, jump to Dell official site for more details. Note that we think Inspiron duo is a high-performance netbook with a fun touch screen.